You have a Vata-Kapha constitution. This means that you have two dominant doshas. You are naturally inclined to creative pursuits, but also have a calm mind that allows you to follow an organized approach. You are usually friendly and have a nurturing personality. Try not to be too obsessed with either routine or achievements, instead maintaining a balance and cutting yourself some slack. Although you have an average build, you are vulnerable to both weight gain and weight loss. Try to find a middle ground in your diet, always opting for moderation. Fortunately, your skin care routine shouldn’t be too challenging as you are likely to have skin that is neither too dry nor oily. Hair loss or thinning is also unlikely to be a problem when your doshas are in balance. With your body temperature on the cooler side because of the cooling effect of both your dominant doshas, you tend to seek out warmer and sunny environments. This dosha combination also makes you quite resilient, endowing you with rather good health. 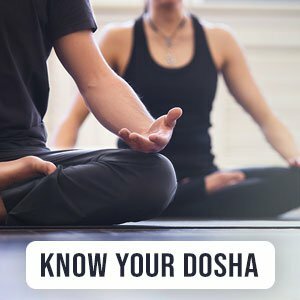 Unfortunately, dosha imbalances can arise at times, predisposing you to problems of poor digestion with bloating and constipation being common complaints. As a kapha-vata type individual, you are also vulnerable to respiratory allergies, congestion, and metabolic disorders.